The “iPhone kills” story just won’t die. Another China Southern Airline flight attendant, this time a guy, has been electrocuted and an Apple smartphone was involved. 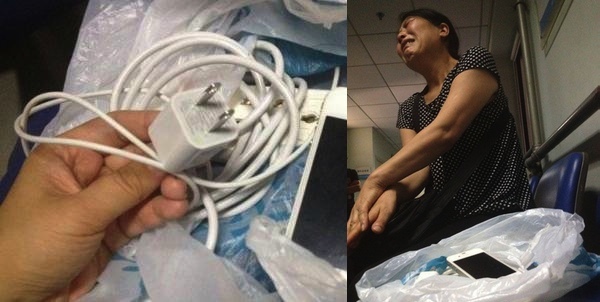 Wu Jiantong is lodged in the intensive care unit of Beijing’s Hai Dan Hospital after suffering a serious shock caused by, you guessed it, a counterfeit iPhone charger. On July 8 at about 10pm, according to the International Business Times, Wu Jian Tong plugged in his iPhone 4 and quickly after was heard shouting “I’m getting shocked” by his sister, Wu Jian Xiang, who was nearby. She somehow managed to unplug the charger, but her brother fell to the floor, writhing and foaming at the mouth. Although paramedics were able to revive the 30-year-old Wu, he stopped breathing again by the time he reached the hospital. Jian was again revived, but fell into a coma three days later, which doctors attribute to brain hypoxia caused by the shock. This is a similar chain of events that lead to the death last week of 23-year-old Ma Ailun, also a China Southern flight attendant, who also used a counterfeit charger with her iPhone 4.